We have these in limited quantity and they are hard to come by. One per order. 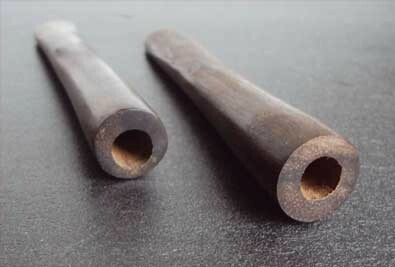 The Chillum or conical pipe has been used since at least the 18th century by sadhus (wandering Hindu monks), in India, more recently in sacrament by Rastafarians in Jamaica and by many to smoke tobacco and related products. This particluar model is made of wood with a long drawtube giving vapors time to travel and cool down before inhalation, as a user draws slowly to control temperature. It is a simple tool but yet one of the most effective and portable smoking tool.